Donna Harris doesn't even notice the smell anymore -- but you would. 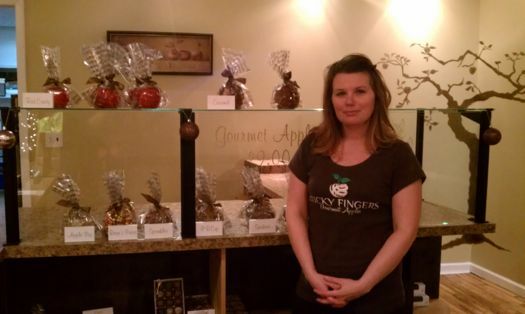 After three years of making gourmet candy, caramel and chocolate apples, the owner of Sticky Fingers Gourmet Apples is used to the delightfully overwhelming scent that wafts through her shops in Cohoes and Troy. 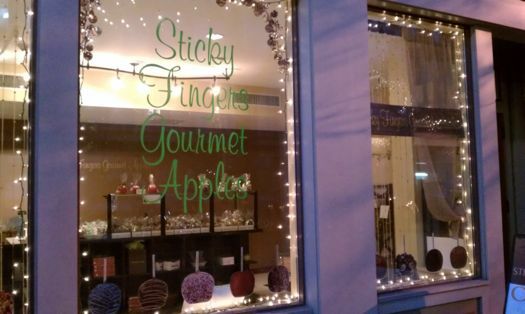 The two-pound apples at Sticky Fingers are covered in more than just jelly or caramel. There's also fluffernutter, praline pecan, dark chocolate and sea salt or cajun spice. I stopped into their new shop on River Street to check out a few different varieties and find out what exactly goes into a $10 gourmet candy apple. Donna Harris doesn't come from a culinary background. Before Sticky Fingers she worked as a fitness instructor at a local YMCA. The candy apples were something she made for parties. 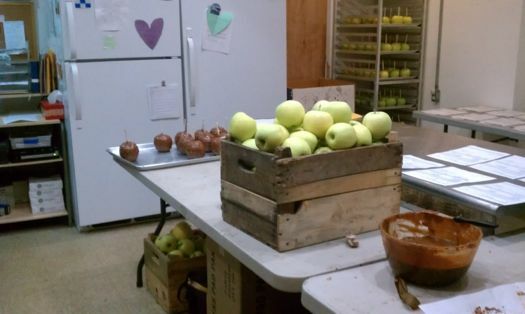 When schedule changes prohibited her from continuing her job, she decided to turn the apples into a business. "I first made them for a fundraiser for my daughter's school. Everyone was bringing the brownies and the cupcakes and Little Debbies, but it was fall and I thought, 'Let me make these candy apples. They'll be fun and a little healthier.' And the kids loved them." What is it about candy apples that she loves? "The slight tart of the apple pairs well with the sweetness of the ingredients -- and then there's the crunch of the apple itself. The crunch and the sweet caramel. And just the nostalgia of being home. I remember making them as a kid -- not like these though. Back then we just dipped them in caramel." Harris learned much of the candy apple trade through trial and error, tempering chocolate by hand before purchasing two automatic machines that now churn milk and dark chocolate throughout the day. She reached out to local chocolatiers like Candy Kraft Candies in Guilderland (whose boxed chocolate products she sells in stores and online) and found them to be helpful and supportive. Sticky Fingers started selling candy apples on the internet back in 2007, and they've had a remarkable amount of success. While internet sales still make up the majority of their business, the Troy and Cohoes locations are both self-sustaining, and Harris says the Troy storefront turned a profit within the first week. As for the development of recipes -- there are 25 to 50 varieties of apples available at any given time -- Harris said they are generally based on what she likes. "There's a lot of taste-testing involved," she said. Harris is very conscientious about using all-natural, quality ingredients and no trans fats. Using only couverture chocolate and apples delivered daily from local farms (currently she uses Samascott's in Valatie), Harris takes so much pride in her recipes that she won't budge on the no-articificial-ingredients rule, even for custom orders. "I had one woman who wanted a Minnie Mouse apple, but the pink chocolate is artificial," she said. Also off the table: "kitchen sink" apples. "It's just not going to taste good," she said. Apples range from classic candy red ($5) to specialty varieties loaded with toppings ($10). 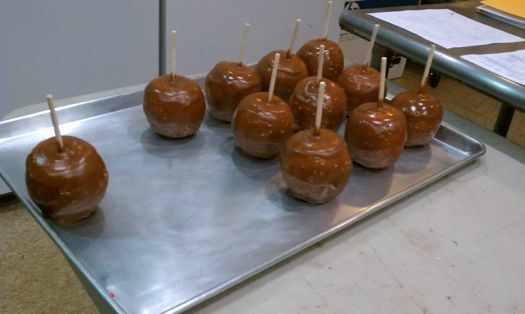 Classic caramel apples are $6, $7 if you want peanuts, and gourmet apples in a multitude of flavors run $9. Harris says the most popular are probably the dark chocolate sea salt and the caramel toffee. M&Ms are big with the kids. So what goes into making a $10 apple? That depends on what you like. One option is the Fluffernutter, which starts with a fresh, 20 oz Crispin (or other slightly tart, slightly sweet green) apple. Harris then spreads on a layer of extra chunky peanut butter from Latham-based The Peanut Principle, followed by a layer of all-natural marshmallow topping from the same supplier. Then, the apple is dipped into tempered milk chocolate, and finished with a coating of toasted coconut. Harris warns that specialty apples aren't meant to be eaten in one sitting, or by one person. "Whenever people want one, I tell them, 'take it to a party'," she said, adding that they can also be kept sliced in the refrigerator for about a week. Harris and her employees can make up to 1,000 apples a day, though they average about 200, with more during the busy season. She said there are no immediate plans to expand the business further, noting that the best part of Sticky Fingers is being able to focus on her fitness hobbies and spend time with her daughters. "I don't want anything to get in the way of being a mom," she said. "If I were working 80 hours a week, I wouldn't be the same person. When we started, we had no idea what to expect, and it's still a guessing game sometimes. It's been such a huge growth spurt, more than I could have imagined." The Cohoes store (190 Remsen St., 874-1304) is open Monday-Thursday from 10 am to 6 pm, Friday from 10 am to 7 pm and Saturday from 10 am to 2 pm. The Troy store (271 River St., 590-1059) is open Monday-Friday from 11 am to 6 pm and Saturday from 10 am to 2 pm. Yay Sticky Fingers! A great success story in Cohoes. Those apples make a great Christmas gift for all you last-minute shoppers out there. One of the best parts about Sticky Fingers is how nice everyone is! Donna and her family are such great people...which makes eating hundreds of their chocolate dipped oreos almost guilt free!!! LOVE Sticky Fingers Apples & LOVE the Harris Family too! There are no apples anywhere that compare to the size & quality of Sticky Fingers and the first rate service you find from the Harris Family - they're simply the best!